There's a pretty clear dividing line in the scientific community between those who belief that Jurassic Park is a cautionary tale, and those who think that instead, the movie is something to aspire to. 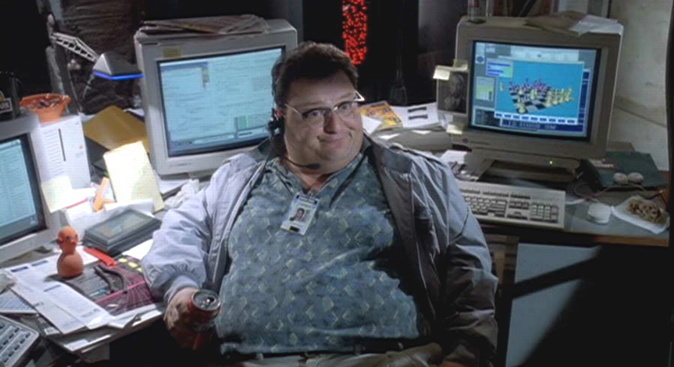 After all, the real mistake in the original Jurassic Park was not investing in a better IT support team. A group of scientists, no doubt inspired by the actions of the fictional John Hammond, have created a brand new synthetic set of instructions that can survive harmoniously within DNA. The result is an E. Coli cell that contains genetic coding which has been designed by a human, and which could lead to scientists being able to design and grow organic life forms that are completely of our own design. According lead scientist Floyd Romesburg, "I would not call this a new life form—but it's the closest thing anyone has ever made." Essentially, the scientists have bio-engineered a pair of amino acids that can be spliced into existing DNA strands within a cell, dramatically changing the coding within a cell in order to make a wholly original creation. This is very different from recent experiments to repair DNA within patients who suffer from genetic diseases, because instead of simply correcting a mistake within a person's genetic code, this process involved inventing a completely original set of instructions through the use of a lab-made protein. Initially, this has been tested on E.Coli, a bacteria with a very different genetic structure to humans, so this can't be used to make the X-Men a reality just yet. Whether fiddling around with their genetic makeup or blasting them into space, scientists love experimenting with E.Coli essentially because it's easy to keep track of simple organisms as they adapt in different environments—even if it does often run the risk of accidentally creating a dangerous zombie plague. Rather than using this technology to create the Indominus Rex of E.Coli strains, scientists are hoping that their synthetic DNA will be useful in developing new kinds of drugs that will be more effective thanks to their being specifically tailored to help with human health concerns. As antibiotic-resistant diseases continue to grow and thrive, modern medicine needs a way to avoid seeing all penicillin becoming utterly useless in the face of human-bred germs that laugh at our most powerful medicines. While progress has been made towards perfecting this technology, there are still some drawbacks, so it'll still be a while before scientists are able to synthesize a cure for the Common Cold. The biggest problem with this process of creating new life is that the synthetic strands of DNA can only be produced in a laboratory, which means that scientists can't set them going within cells and expect them to multiply naturally. Until this problem is solved, it's going to be a long wait for someone to finally make the dream of owning a pet velociraptor a reality.